Boasting an entirely new ergonomic design, STAGEMAKER SR is the only model available on the market fitted with double lifting brake, retractable handgrips and protective rubber pads. 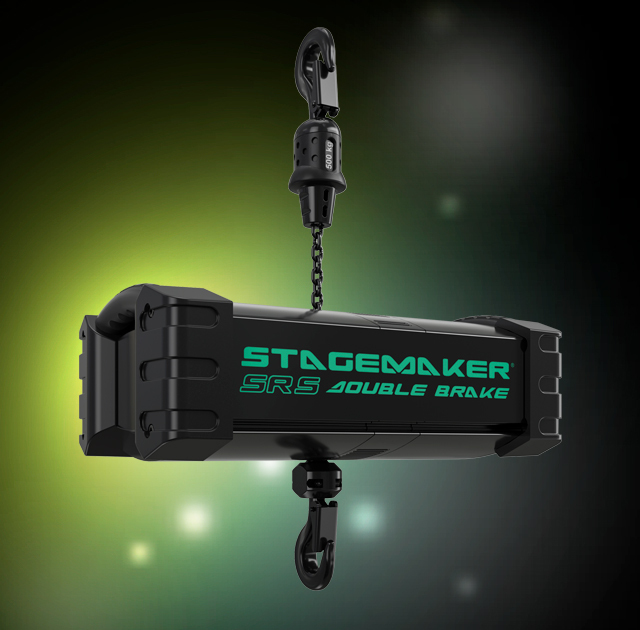 STAGEMAKER SR fits in well with all types of installation offering best-in-class safety and productivity. Hoist body is powder coated with black, protective 70um paint, allowing it to perform under the most extreme conditions. Hoist meets ecology regulations and is RoHS compliant. New “Perfect Push”, patented concept, 5 pocket load wheel, fitted with 5 intermediate teeth. This innovation provides improved chain guiding and chain flow, to help reduce the risk of chain jamming. Chinflux design provides a horizontal flow of the chain from the load wheel. this design, along with the high strength aluminum construction, allows for a more fluid flow of the chain into the chain bag and helps reduce the risk of chain jamming.